Added natural plant-derived Proteolytic Digestive Enzymes GAIN MUSCLE THE HEALTHY, NATURAL WAY The name (MUSCULAR WEIGHT GAIN) implies our product is geared for only bodybuilders and athletes. Although it was formulated with the bodybuilder and athlete in mind, the concept was to make a product that anyone can use to gain weight in a natural and healthy manner. 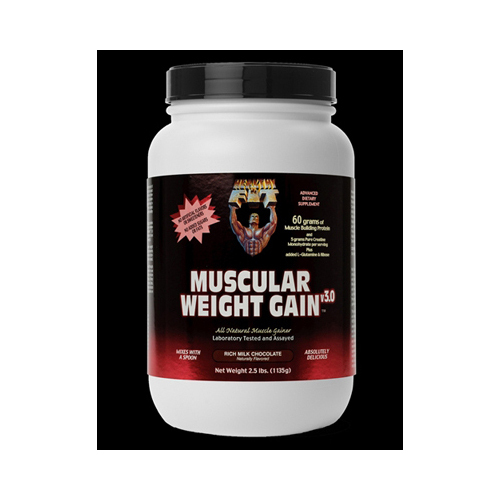 In combination with proper exercise, MWG3 is formulated to produce a quality weight gain of lean body mass (healthy muscle tissue) and not adipose weight (unhealthy fat tissue). Many other brands available are highly saturated with sugars, excessive starches, artificial flavors and sweeteners, salt, fats, and other "junk" and inexpensive ingredients to boost calorie content and improve taste. Be leery of these products as these ingredients will produce a definite weight gain, but one of fat tissue, which is not healthy and a burden on your entire system (especially your heart). Pro-Amino proprietary blend of immediate and extended release Anabolic Proteins, Peptides, and Amino Acids [Including: Highest Bioavailability Whey Protein Complex (containing Whey Protein Concentrate, Isolate, and Hydrolysate - each rich in Beta-Lactoglobulin, Alpha-Lactalbumin, Glycomacropeptides, Immunoglobulins, Serum Albumin, and Lactoferrin), Calcium Caseinate (containing Alpha, Beta, and Kappa Caseins), Egg White Protein, L-Glutamine], New Tech 2.0 complex Pro-Carbo Blend (Concentrated Glucose Polymers, Brown Rice Powder, Inulin, Ribose), Dutch Cocoa Powder, Creatine Monohydrate, Natural Flavors, Stevia Herb Extract, Papain and Bromelain (Natural Plant-Derived Proteolytic Digestive Enzymes), Lactase, Soy Lecithin. CONTAINS: MILK, EGG, AND SOY. Whey and Casein are milk derivatives. Soy lecithin helps to naturally instantize the product. 10.25" x 5.75" x 5.75"